Specially formulated floor cleaner for scrubber drier use. Rapid action, cleans thoroughly in one pass of the machine. Controlled foam will not block suction drier. Ideal for automatic cleaning of food storage areas, factories, warehouses and supermarkets. Biodegradable, phosphate free. Suitable for all scrubber drier machines and for general machine scrub applications. 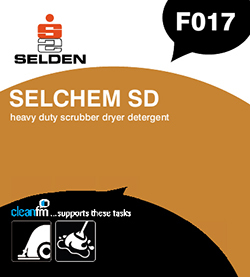 For heavy duty scrubbing and stripping dilute Selchem SD 1 part to 10 parts hot water. For maintenance cleaning dilute Selchem SD 1 part to 80 parts water.